Mindy was not only a pleasure to work with, but her cakes aren’t seriously AMAZING! Everyone raved about her tres leches during our wedding. I would absolutely recommend her! Mindy's bakeshop is awesome. They designed a beautiful wedding cake for us. I provided some pictures to Melinda as references. She made a perfect nautical theme wedding cake for me. Melinda is very professional, patient and cute. I love the wedding cake so much. I could see she put in a lot of effort in designing and making the wedding cake. All of our guests enjoyed the wedding cake. It is delicious. I HIGHLY recommend Mindy's bakeshop to everyone. If for some STRANGE reason you're not already convinced by checking out Mindy's Instagram, take it from me- this husband and wife duo is THE BEST!! Mindy is a cookie magician. I sent her a picture of my Jack Russell and she took the picture and made it into a cookie of my dog's face!! Teeth and all! EVERYONE loved them. She also helped me surprise my groom and his groomsmen by creating playstation controller cookies. Amazing. Just amazing. It also helps that she must be the sweetest person on the planet!! You WON'T be disappointed with Mindy's Bakeshop!!!!! Mindy's Bakeshop made my wedding cake, and I honestly couldn't have asked for a better vendor experience. From the tasting to the conceptualization of the design to the actual final product, Mindy and Ken were amazingly professional, kind, and totally receptive to our needs. Our cake was BEAUTIFUL, and it was so delicious that we're still getting compliments on it months later. 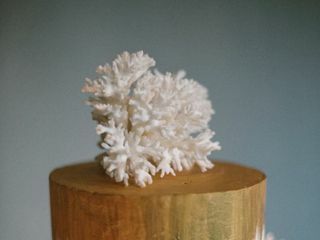 I highly recommend Mindy's Bakeshop to anyone looking for the wedding cake of their dreams! Mindy was a true joy to work with through the entire process! She was extremely open to accommodating my food allergies and had such fun innovative flavors to pick from. Through the ordering process, she made it very simple and easy! And of course the most important part, the cakes and treats she baked were not only beautiful, but they were all delicious. It was so fun getting to see our dessert table come to life. I truly cannot recommend her enough, not only for big life events like weddings, but every day celebrations! Mindy was an absolute pleasure to work with. She was responsive, friendly, professional, and understood exactly what we wanted. She did an amazing job and we got so many compliments on our cake. I definitely recommend working with Mindy. Mindy did a FANTASTIC job creating our cookies and cupcakes for the night! They were delicious and beautiful – we were looking for creative, Texas-themed designs, and they were exactly what we were looking for. She did a fantastic job, and I will absolutely use her again. So it's only been 6 weeks since our wedding, and I just picked up another cake from Mindy today. It's THAT good. This is genuinely the best cake I have ever had. Mindy is so creative and talented, and she is such a pleasure to work with. You can trust her with any vision or request. The entire process was flawless from tasting to delivery. Mindy offered us a tasting of several cake flavors, and it was one of the most difficult decisions of the wedding (so we went with a red velvet cake and cupcakes to cover the rest of the flavors). So excited to start ordering Mindy's sweets for all special occasions. 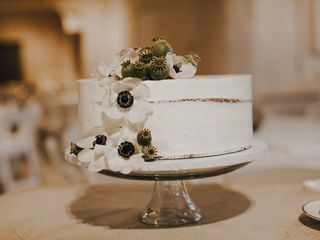 I ordered the mexican vanilla with lemon buttercream frosting naked cake from Mindy's for my wedding and it was delicious! Also, the cake was beautiful. Exactly what I was going for and Mindy was super easy to work with. Mindy did a great job designing our wedding cake to fit within a simple barn music festival #barnaroo. We met up one time before the wedding to design some sketches, laugh and joke around, and sample 4-5 of our top flavor choices for the cake (which were beautifully made and decorated just for us). We had an incredibly tough time deciding which flavor to choose since they were all so delicious and decided on a different one for each layer. We had several people come up to us during the reception to tell us how delicious the cake was and that they went for 3rd's and 4th's! We loved our cake from Mindy's Bakeshop. I contacted Mindy through her website and we corresponded via email. She was very responsive to my multiple emails. She created such a beautiful cake for a very reasonable price. The cake and buttercream were delicious! We had so many compliments from our guests on how great it tasted! We would love to do business with Mindy again and are planning on ordering a smaller version of this cake on our one year wedding anniversary! Mindy was wonderful! I asked her to make 5 different cakes for my wedding reception. She was so accommodating and I let her take the reigns on the design. She allowed us to pick up on our own time and was super friendly and sweet. Not to mention the cakes were out of this world! They were very well decorated and looked absolutely incredible. My guests were drooling over them. We got the Strawberry, German Chocolate, Peanut Butter Cup, Mexican Vanilla, and Coconut. They were all delicious! Everyone had very good things to say. My favorite was the Strawberry, but the Peanut Butter was definitely the crowd favorite. It was gone in 30 minutes! My husband and I want to get cakes from her whenever a craving hits! Mindy is simply the best! Her cakes are beautiful, charming and even taste great. Not many wedding cakes can say the same thing, which is why I am so glad I chose to go with Mindy when picking our wedding cake. We also got a groom's cake with her, which was so creative and just perfect. She was on time, always very easy to get a hold of leading up to the wedding and so friendly. 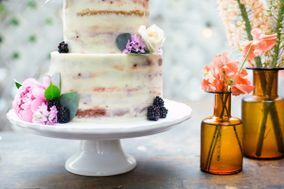 She truly loves her clients and cooking, and when both are combined it makes for a really magical wedding. Thanks Mindy! Mindy is seriously the best. 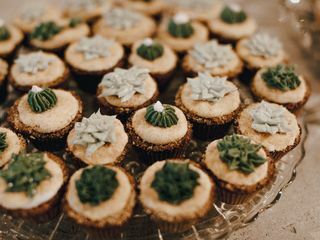 My husband and I wanted 5 different cakes at our wedding (we love sweets!) and Mindy made each of them so perfectly -- 2 of which were vegan for me! 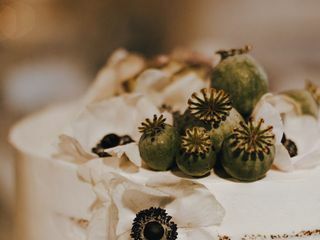 Our cakes were probably our favorite thing about our whole wedding. 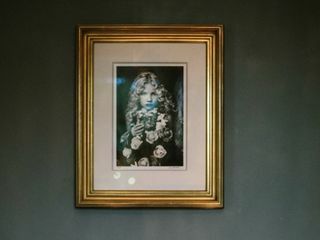 Also, it was a joy to work with Mindy; she really takes time to get to know her clients and truly made us feel relaxed! We really enjoyed working with her! I'm a wedding planner and I recommend her for all of my clients, so I also recommend her for your wedding! Mindy was my absolute favorite vendor from my entire wedding. We had fun tasting samples with her and getting to know her, she helped me figure out how I wanted my wedding cake to look since I didn't have a whole lot in mind, she gave me tips for freezing my top tier (which was still perfect on our year anniversary), she did an incredible job on my husband's very detailed groom cake, and she is such a sweet and genuine person. My husband and I loce sweets and have high dessert standards - Mindy not only met them but far surpassed them with her cakes. We have since ordered custom cakes and cupcakes for numerous occasions from her and she always delivers, both in design and taste. I can't recommend her enough. Mindy's Bakeshop was easy to work with, made a custom cake, was on time and most of all, the cake was delicious and beautiful!! !